highly creative and experienced design team to assist you FREE of charge with your custom design. one of them.They are by far our favorite type of patch style. and almost “photo-like” quality that will impress you. 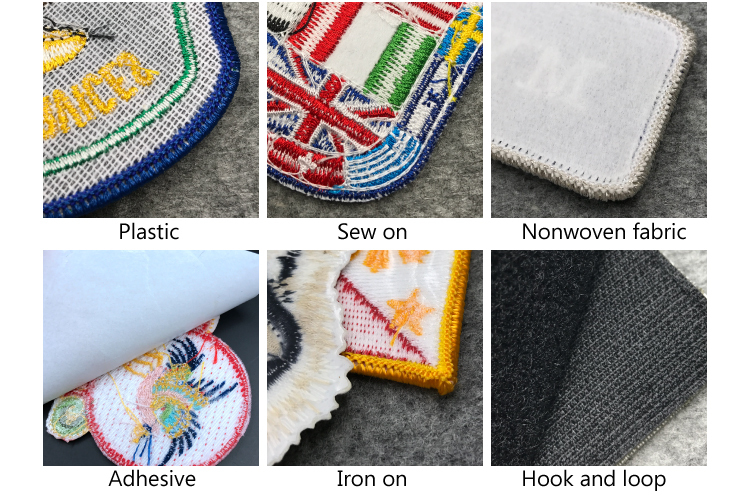 Why Choose Embroidered Patches vs Direct Embroidery ? • MORE VERSATILE --- You can apply patches anywhere. • MORE PROMINENT --- A patch has a “3D” texture that makes your logo stand out. 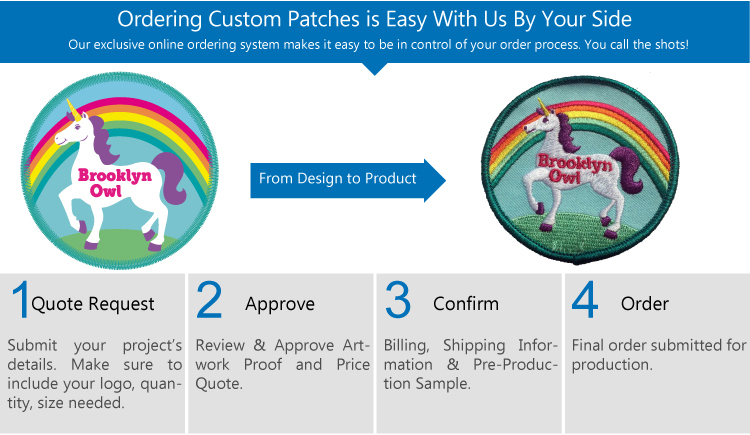 • LESS EXPENSIVE --- High-stitch-count designs are more affordable withpatches. • NO PUCKERING --- Direct embroidery tends to gap and pucker; patches don’t. 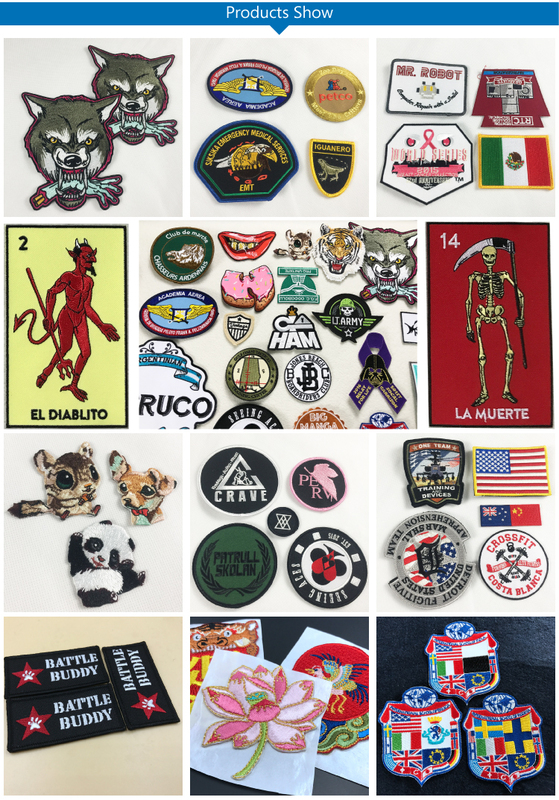 • COLLECTIBLE --- Patches have become collectors’ items – let us help you create your own work of art. • FASHIONABLE --- Patches are back and are retro cool! Q: How many colors can I get on each custom patch? A: We can include up to 12 colors per custom patch design. 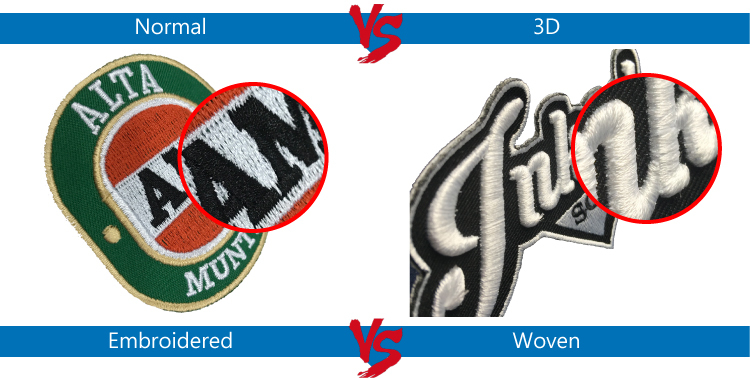 Q: What’s the difference between embroidered, woven, and dye sublimated patches? A: Embroidered patches are created by stitching various colors of thread onto a substrate fabric (also known as twill). We can achieve the greatest degree of dimension with embroidered patches. Woven patches are created using a loom and various colors of flexible yarns that are woven together to form the patches. Dye sublimated patches are created by dying the patch fabric. We use dyes that bond with the molecules of the fabric to produce a very detailed image. Q: What’s the best type of patch for detailed designs? A: You can achieve detail with all three of our patch types. For the most intricate images and lettering, however, we suggest our dye sublimated patches. Q: Do you offer any special backings? A: Yes, we offer heat seal, hard hook & loop, soft pile hook & loop, and self-stick. We also offer military clutch pins and folding magnetic backings for our bullion crests, all for an extra cost. Q: After I fill out a free quote, how soon can I expect a response? A: We answer most quote requests within 24hours. If you need an immediate response, however, simply fill out our quote form and then give us a call. Q: How will I know if I’ll like my patch design? A: After we confirm your order, we create a sample of a new patch design and send you a photo of the sample for your approval. Q: What does “embroidery coverage” mean? A: Embroidery coverage refers to the amount of patch that has been stitched. For example: 75% embroidery coverage means that 75% of the patch has stitching and the other 25% of the patch is blank. Q: Are your custom patches machine washable? A: Yes. 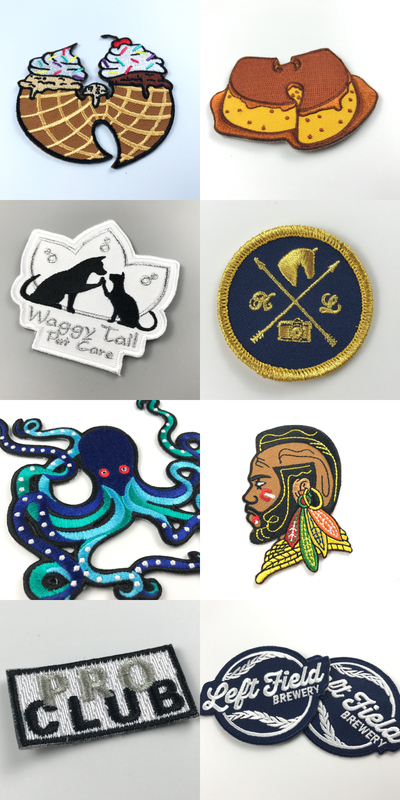 All custom patches except our hand-embroidered bullion crests are machine washable. Q: How long will it take to receive my patches? A: Delivery is about 6-15 days depends on the quantity. Rush time is 6 days. Q: What if I want to cancel my order?